"The idea behind this is not to create a computer that makes music for me, it's to create an instrument that I'm playing," Ólafur Arnalds says. He remembers seeing the machine — something of an updated pianola, the old ones often seen in old Western movies plunking out notes dictated by holes in a roll of paper — and laughing at its function. "I just looked at it and thought, 'OK, that's very silly. That's a very bad idea, but I wonder if there's something there we can work with.'" However silly, it planted the idea of incorporating technology into his own composing. So, he got together with his code-savvy friend, and together they created a new way to play piano using software. "It senses what I play. Usually I am sitting at a grand piano, and I would play a chord," he explains from behind his instruments after playing a set at NPR's Tiny Desk. "That chord goes into the software, which manipulates it and then sends it out as rhythmical textures to these two pianos." Arnald's whole rig consists of two pianos, a laptop loaded with the custom software and Arnalds at the helm with a small keyboard. He plays silent chords on the keyboard, like a remote control of sorts, then the chords are run through the software, and the piano plays a spontaneous array of notes based on the Euclidean algorithm. It's not simply AI-created music, though. "The idea behind this is not to create a computer that makes music for me, it's to create an instrument that I'm playing," he says. Instead of hitting one key and getting one note, Arnalds can hit one key and get a multitude of unanticipated notes. That does pose one problem, though: There's no way to replicate what the piano does, which proved difficult in recording his new album re:member, due out Aug. 24. But there's also a spirit of serendipity that comes from it all. "We're all here, and we're watching a concert that will never be replicated exactly the same," he says from the Desk. "We're all living in this unique moment in time, which will never happen again." KELLY: ...Straying from our regular theme music to bring you a recent Tiny Desk concert. 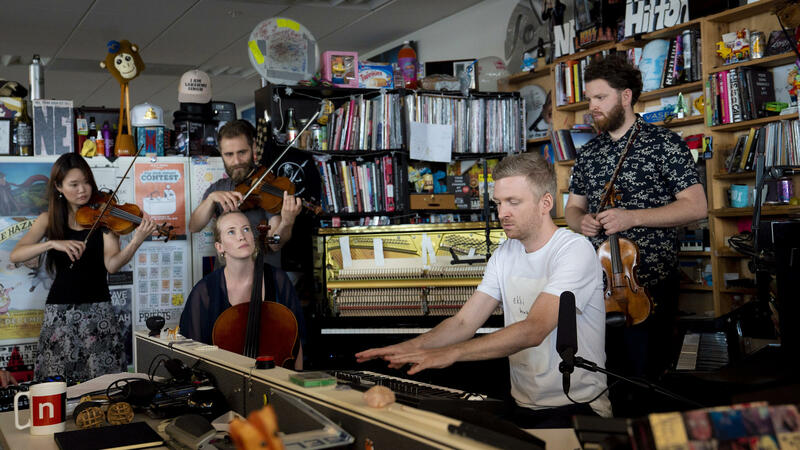 KELLY: That's Icelandic composer Olafur Arnalds and a string quartet. What you can't see is Arnalds playing a keyboard over a tiny laptop. Behind him are two upright pianos. They are playing along, keys moving by themselves almost like a ghost is playing. OLAFUR ARNALDS: There are no ghosts here on these pianos. I can tell you that. KELLY: No ghosts, just software - artificial intelligence. Arnalds and a friend invented the STRATUS piano system. Think of it as a modern take on those player pianos from old Westerns. ARNALDS: The first time I saw them, I was in Asia in a hotel lobby. And it was playing "Yesterday" by The Beatles. And (laughter) - and I just looked at it, and I said, OK, that's very silly. That's (laughter) - that's a very bad idea. But I wonder if there's something there we can work with. ARNALDS: The main thing is the brain that's in the computer. It's a software that I created with a friend of mine who's a coder. And it senses what I play. Usually I'm sitting on a grand piano, and I will play a chord. That chord goes into the software, which manipulates it and then sends it out as rhythmical textures to these two pianos. KELLY: So show me what happens when you play. ARNALDS: So when I - I'm going to play you C major chord now. ARNALDS: ...In that rhythmical texture that the software generates actually by very dumb AI, like, very not advanced AI. ARNALDS: Yeah. It's like AI that people who don't really know AI make. KELLY: Which is this - your software, the very dumb AI. OK.
KELLY: How dumb is it? I mean, is it learning? If you were to play that chord again, would it play something different? KELLY: You're sliding a little slider on the left up here. KELLY: And that's going to change what comes out of these pianos behind us. ARNALDS: Yeah. It will maybe do more of the upper octaves or more of the lower octaves and dance around the keyboard a bit more. KELLY: So you can influence what's happening on the pianos behind you. ARNALDS: Yes. It's fully - like, nothing happens if I'm not there. I can control how much random. I can control the rhythms. There's no real AI here. There's no real learning here. It's just an instrument. KELLY: Why? Why does the world need this? ARNALDS: (Laughter) Because as creative people, we get so accustomed to the tools that we have. I'm mostly a pianist. I compose by playing the piano. And I found myself in a rut. Like, I'm composing the same pieces of music over and over again. So how do you break that pattern, and how do you manipulate your creative impulses in a way? Like, the response I get from playing the piano - I wanted that to be different. KELLY: Something you couldn't anticipate. KELLY: Why is that better than playing with two other human musicians who might also do something that surprises you? ARNALDS: Well, that's just my - me being particular and (laughter) not liking people in general (laughter). KELLY: Better to play with a robot. They don't get drunk after the show. KELLY: I guess there's that. ARNALDS: No, there's something fascinating about technology. And if we look at the history of music, every time we heard a new type of music coming out was when somebody came up with a new way to play an instrument. We wouldn't have any rock 'n' roll music if there was no electric guitars. And I'm not saying that what I'm doing, it's the new rock 'n' roll, but at least I'm bringing my own compositions to a new place where I would never have brought them if I didn't have this. KELLY: Last thing I wonder about is you're surrendering a certain amount of control here in the sense that if you come up right now with some song that you love, that you think is, like, the greatest thing you've ever played, you can't replicate that 'cause it's going to play back something different the next time. ARNALDS: Yeah. That was the biggest challenge making the album. When I was writing, if I wasn't recording as I was writing and something - a great accident would happen - you know, like, the software would accidentally go into, like, a weird loop and come up with something great - I could never replicate that. But I think that's also an interesting part of the creative process, right (laughter)? KELLY: One moment - enjoy it. ARNALDS: Just find - yeah, enjoy that one moment like it's - we're all here, and we're watching a concert that will never be replicated exactly the same. So we're all living in this unique moment in time which will never happen again. And I think that's interesting. KELLY: Me, too. Olafur, thank you. KELLY: That's composer Olafur Arnalds, who plays not one but three pianos thanks to his very dumb AI. You can watch him do it at npr.org/music. Transcript provided by NPR, Copyright NPR.